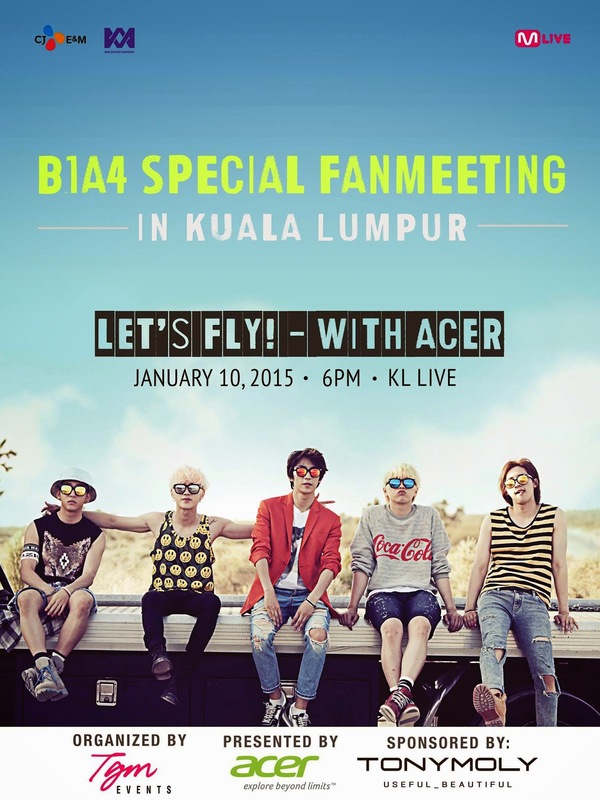 KUALA LUMPUR, MY Following a successful end to B1A4’s 2014 Roadtrip World Tour, CJ E&M, WM Entertainment and MLive will be holding a special fanmeeting with Malaysian fans with B1A4 on the 10th of January 2015 at KL Live with local promoter TGM Events. This fanmeeting is a special event brought to you by Acer Malaysia in conjunction with the release of the Acer Liquid Jade smartphone. Tickets on sale December 7th 2014 at 8PM UTC +8:00. Acer VVIP Package includes one Acer Liquid Jade Smartphone, hi-touch, an additional surprise fan service interaction and a chance to win one of five Goodnight Calls from B1A4. More detailed post regarding what is included in the VVIP package. 1. Hi-Touch: You will be able to hi five each member of B1A4. Please refer to the video link below for what a hi-touch session is. 2. Surprise Fan Interaction: There is another special interaction for fans WITH the artist. We will be announcing this ASAP. One hint is.. make sure to look your best for the special moment with B1A4! 3. Free Acer Liquid Jade Smartphone: The phone retails at the price of RM799 alone. For RM799, which is the price of the phone, you will be getting the phone, VVIP ticket to the fanmeeting, hi-touch and the special interaction. 4. Goodnight Call Opportunity: There will be FIVE lucky winners for the Goodnight Call and the winners will be chosen at random to receive a call from B1A4. Details on how to win Goodnight Calls will be released at a later date. 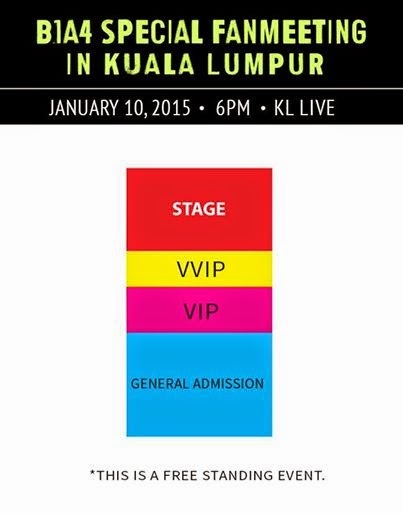 VIP Tickets will include Hi-Touch. GA Priority will be in the same sections as GA Standard but will have priority entry into the venue which means you will be able to enter before GA Standard ticket holders. Tickets will be sold on http://tgmevents.tictail.com/ As we are a US company, tickets will be sold in US Dollar according to conversion. Prices on TIctail will already include taxes, fees and shipping so it will appear a little bit higher. Your tickets will be mailed to you via Poslaju or can be picked up during offline events. For those of you who do not have credit cards or Paypal, we will be accepting orders on hello@tgmevents.com and payment can be made with local bank transfer to our Public Bank account. 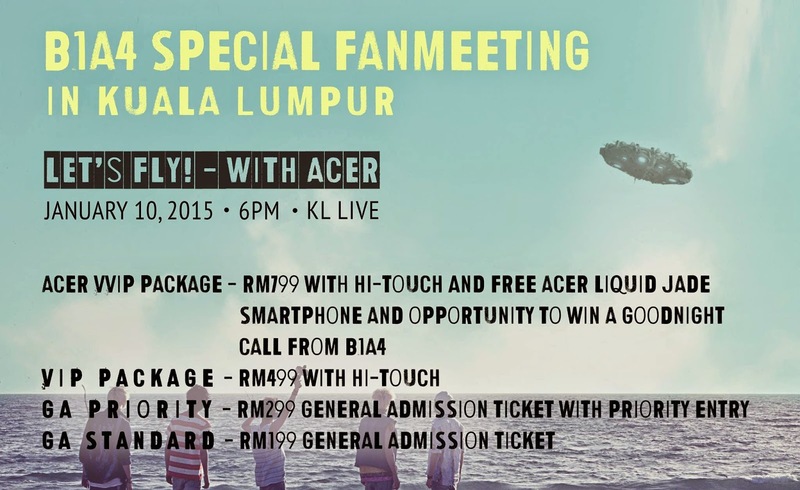 E-mail us with the subject title [B1A4 Ticket Purchase] and your Name to begin your order. Please be sure to have the correct subject line for us to be able to track your order. Information on offline ticket sales will be available at a later date.